vvvatlas wrote: Is 275% ias with Dao/2h overkill. I'm not sure what the breaking point is. 110% attack speed on weapon is enough. attack speed on other itemns doesnt work on wolf. I wanna play wolf, but untill i saw this comment . Is this a bug, and does it work now? Edited: All IAS work on wolf form, i have just tested! The max IAS on gear should be around 80% from what I checked on the spreadsheet. It's been a while though. I thought it didn't matter either but it makes a difference to have some IAS on gear. Thanks for the awesome guide. Wasn't all plain sailing, but managed to get to lvl120 inside a couple of weeks of the new season. Got myself some of the easier charms and some decent gear to boot. Did we ever get to the bottom of the Wolf ias question? I'm at the stage where the main upgrade for me is to craft some Mana/Life AEK jewels and it would be handy to know how much ias on weapon and/or other gear I actually need . I'm using Carsomyr, and have thrown x4 15%ias jewels in it - but is that enough? 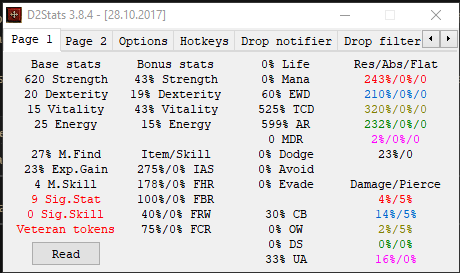 D2stats suggests I have 205%ias in total. Hello and I'm sorry if my question is silly, but what MO should I use on my armor and my weapon? from higher priority to lower priority. I am new at this. Thank you! Well, I feel that it becomes too slow when I use the Harbinger that has 0 cooling. Is it because of the FHR? The construction works perfectly at a high level. For now, at the low level 50-90 it is impossible to have that amount of FHR to break the frames, I think.